Discussion in 'FIFA 18 Editing' started by Aranaktu, Jun 22, 2018. Hey guys. Since I'm playing FIFA (2003) I was always curious why there isn't any save editor for this game? A few months ago I've decided to start reverse engineering a save file format in order to make a fifatracker website. I'll post here what I've found so far. FIFA 18 is pretty much already dead, but I'm sure it will be still useful in next game edition. Already I've managed to edit some basic stuff like transfer budget and player form. The biggest achivement is probably adding "Future Star" to current career. I'm also too lazy to make complete save editor, but I'm still open for cooperation, so if you want to make that kind of tool just PM me. First of all, FIFA saves are stored in "Documents\FIFA 18\settings". File name must start with "Career" keyword, and after that we have date of last save in format "yyyymmddHHMMss". Now let's open game save in hex editor and take a look at file format. 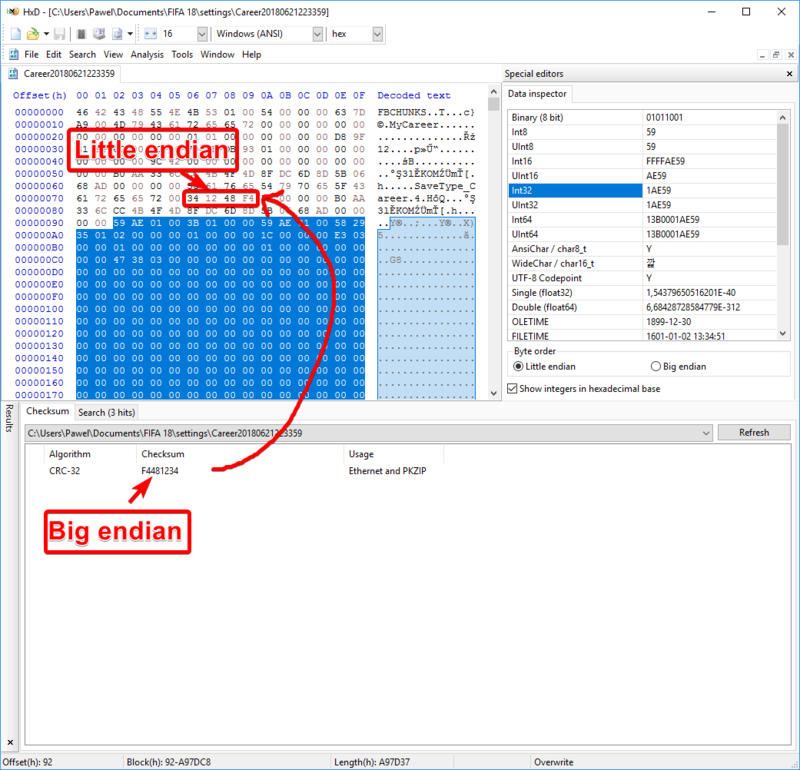 Note that all values are stored in little-endian byte order. After file header we can distinguish 3 main career file sections . The most important thing here is CRC32 checksum located after "SaveType_Career\0". You need to recalculate it if you want to change anything in your career save. CRC32 checksum if calculated from offset 0x92 until the end of the whole file. Tbh. I've no idea what is the rest of the data in this section. 99% of it are null bytes. In this section we have 3 fifa databases. First one contains tables with "career_" prefix. The second one contains more common and well-known tables like "players" and "teams"
And the third one contains just a single table called "teamsheets"
If you want to take a look at what's inside these databases you can use my https://gist.github.com/xAranaktu/96e40cb2287372bbbe405408485a87e4 to unpack them from career save. And then just open .db files with https://www.moddingway.com/file/45991.html. You will probably also need https://pastebin.com/sH1B3WVe file. So far I've not managed to run the save with edited database. Here we can find stuff like transfer budget, player statistics/morale/form, info about injuries. Basically, everything which is not stored in the databases. Most of the structures here have their own signatures. 4 Bytes - competition id? mi001 & ti001 - total shirts sold? se001 - avg attendance this season? msrajjc2, Andreasmax and beta990 like this. Hey guys. Since I'm playing FIFA (2003) I was always curious why there isn't any save editor for this game? Also, rinaldo created a tool which we used for years to open/edit the save file, that worked up til FIFA 16 I believe. And there was a save file hex-editing thread already, the FIFA 17 forum I think. After these changes you need to start new career or not? I'm talking about tool which will not require that, and that's what I'm showing. Okay, yeah I didn't see where you mention that in your write-up. Carry on. Great work @Aranaktu this is v interesting - thanks! Interesting. This is the type of thread that i like. About CRC is the standard CRC32 algorithm or a custom one? Have you tried to use all 0 as CRC? This sound strange but there is a possibility that it work. It's standard CRC32 algorithm. And yes, all 0 are working. Thanks for that tip. How can I convert a save file (Career20180814012708) to a data base(db) file or a squad file?